The Range Rover Evoque set some high standards when it descended onto the compact SUV segment back in 2012, it was stylish and ultra-luxurious and four years on those looks have aged rather well. 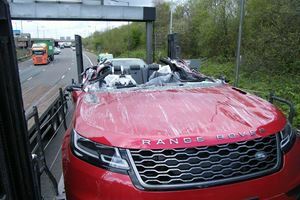 The latest convertible version may seem like an answer to no question in particular but it may yet prove to be another insightful niche creating move on Land Rover’s part. The interior of the Evoque convertible is based on the rest of the range and it offers the same mix soft-touch materials and high-quality leather surfaces. The front seats are well-padded and offer good support for longer trips although the rear seats are a tight fit for most and the available cargo space is less than most of its competitors. The folding fabric roof can be operated at up to 29mph and takes less than 20-seconds to fully open, when up, the headroom is quite restricted in the rear. 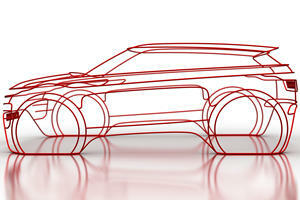 The Evoque offers a more car-like driving experience than its tall dimensions would suggest and it can tackle sharp corners and tight and twisty roads with confidence. The ride is firm but not unduly harsh and while few owners will be fording rivers in their Evoque, they can rest in the knowledge that they can. The cabin is almost as hushed at speed as in the hardtop Evoque and it is smooth and planted at highway speeds. 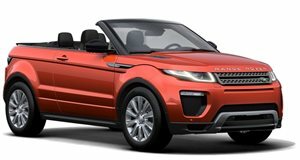 The Evoque convertible is available solely with a turbocharged 2.0-liter 4-cylinder engine which makes 237 horsepower and 250 lb-ft of torque, power is sent to all four wheels through a 9-speed automatic transmission. The Evoque is no lightweight although a claimed 0-60 mph time of 7.6-seconds is commendable if not as quick as more traditional convertibles. Compared against other luxury compact SUVs it also falls some way short of cars like the BMW X3 and Porsche Macan. Despite its lack of outright speed, the Evoque is more than capable in both city and highway motoring and the claimed average 23mpg rating is commendable too. The Evoque Convertible is offered in SE Dynamic and HSE Dynamic trim levels. SE Dynamic Trim offers a wide range of standard features such as 18-inch alloy wheels, 10-speaker Meridian audio system, 10-inch touchscreen with navigation, Bluetooth streaming, WiFi hotspot, 12-way power front seats, leather upholstery, cruise control, power folding heated exterior mirrors and rain-sensing wipers. Safety levels are high with standard items including emergency brake assist, rearview camera, surround parking aid, trailer stability assist and rollover protection. A driver Assistance Package for the SE trim adds blind spot monitoring and reverse traffic detection, auto high beam assist and a HomeLink garage door opener. The SE Technology Package adds keyless entry, Xenon headlights, front foglights and headlight washing system. The famed Land Rover off-road ability has not been forgotten either and hill descent control, roll stability control and a Terrain Response system are all included too. HSE Dynamic Trim adds to the above with heated front sport seats, adaptive suspension and a number of unique design details. 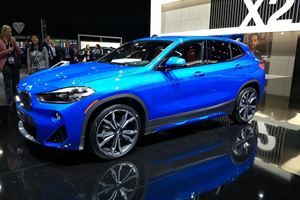 This trim level also offers a number of packages that offer advanced driver aids (park assist, adaptive cruise control and traffic sign recognition) and even more luxury fittings such as a Meridian surround audio system. While any number of SUVs or convertibles can provide more practicality and performance than the Range Rover Evoque convertible, none manage to combine these seemingly disparate traits into one cohesive package. The Evoque convertible may be compromised when it comes to interior space too but most of the target market will be focused on the stylish design and high levels of luxury on offer. The big debut will take place on November 22 in London, of course. Perhaps it will inspire Jaguar Land Rover to put a convertible Range Rover Velar into production. The Range Rover Evoque convertible also needs a rival.